In Decision 2018, it's one of the most controversial ballot questions in Massachusetts. Question One would limit the nurse to patient ratio, but many health care professionals are against the idea. Supporters of Question 1 were joined by the Boston Firefighters Union as it endorsed the ballot question that would establish ratios limiting the number of patients, usually to about four, that can be assigned to an individual nurse. 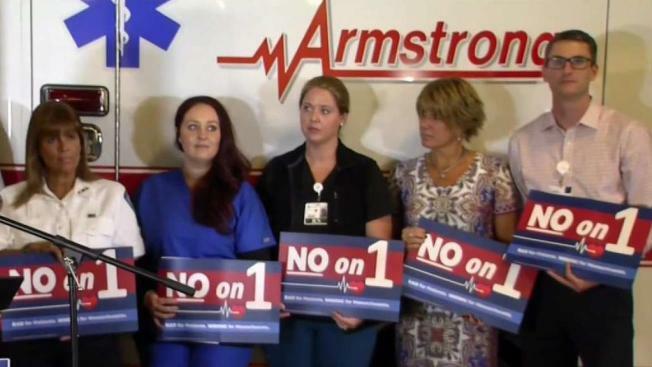 But opponents, who held their own news conference, say wait times in emergency rooms would be greatly extended if Question 1 passes and the current high level of nursing expertise could be compromised. “We run the risk of having to hire nurses with less experience who we worry about, can they be the best people to take care of patients who present to the emergency department,” says Martha Rafferty, director of Emergency Services at Emerson Hospital. But supporters of Question 1 say their opponents are spreading a lot of misinformation. A new report by the Health Policy Commission says the ballot question could cost upwards of $900 million. Supporters of Question 1 say that number is outrageously inflated and more like $40 million. Advocates on both sides of will face-off in a televised debate on Oct. 24, only on NBC10 Boston.